Previous attempts at making 3-D photonic crystals have resulted in devices that are only optically active, which means they can direct light but are not electronically active, so they can’t turn electricity to light or vice versa. It’s been a tantalizing problem. Getting to electric crystals could offer new or extremely efficient energy devices. University of Illinois researchers have demonstrated the first optoelectronically active 3-D photonic crystal, an advance that could open new avenues for solar cells, lasers, metamaterials and much more. 3D Semiconductor Method. Click image for more info. Due to their unique physical structures photonic crystal materials can control or manipulate light in unexpected ways. Photonic crystals can induce unusual phenomena and affect photon behavior in ways that traditional optical materials and devices can’t. They are popular materials of study for applications in lasers, solar energy, LEDs, metamaterials, etc. Professor Braun’s team built photonic crystal has both optic and electric properties. The journal Nature Materials published the team’s study paper online line this past weekend. The build process seems quite easy, even though technically challenging, there is some existing commercial activity to build and grow from. To create a 3-D photonic crystal that is both electronically and optically active, the researchers started with a template of tiny spheres packed together. Then, they deposit gallium arsenide (GaAs), a widely used semiconductor, through the template, filling in the gaps between the spheres. The GaAs grows as a single crystal from the bottom up, a process called epitaxy. Epitaxy is common in industry to create flat, two-dimensional films of single-crystal semiconductors, but Braun’s group developed a way to apply it to an intricate three-dimensional structure. Once the template is filled, the researchers remove the spheres, leaving a complex, porous 3-D structure of single-crystal semiconductor. Then they coat the entire structure with a very thin layer of a semiconductor with a wider bandgap to improve performance and prevent surface recombination. 3D Photonic Crystal LED. Click image for more info. For a test of the technique the group built a 3-D photonic crystal LED. This is the first such working device. The team deserves congratulations on an innovation brought to a working lab unit. Braun’s group is now working to optimize the structure for specific applications. The new LED demonstrates that the concept produces functional devices, but by tweaking the structure or using other semiconductor materials, researchers can improve solar collection or target specific wavelengths for metamaterials applications or low-threshold lasers. “From this point on, it’s a matter of changing the device geometry to achieve whatever properties you want,” Nelson said. It really opens up a whole new area of research into extremely efficient or novel energy devices. How far this can go is anyone’s guess for now. 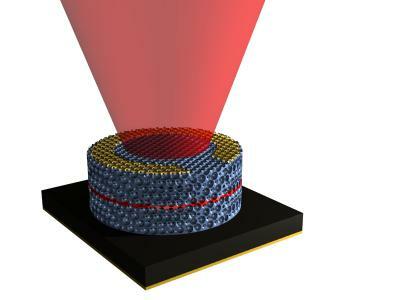 Stacking up a semiconductor in 3-D form such it will operate both optically and electrically shifts the whole field of light and energy both at harvest and at use. The prime questions to come are how much cost and how efficient? The answers may prove quite interesting in a field that has just now opened up.